CALCITE balances male/female polarities, alleviates fear, reduces stress, emotionally balancing, grounds excess energy and misplaced enthusiasm, some claims indicate an improvement in astral projection. 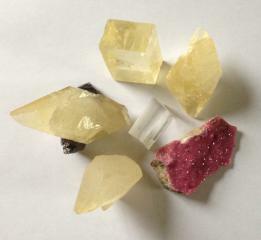 Calcite brings joy, lightness. On a physical level it has positive effects on the kidneys, pancreas, spleen. CALCITE is linked to the zodiac sign GEMINI and the MOON. According to colour of the stone. Part stellar beam calcite crystal. There is a small cleave on the termination. Location: Gloucester, United Kingdom. Dimensions: 3 x 2 x 1.5 cm.